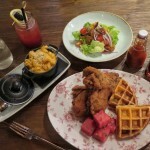 THE BIRD SOUTHERN TABLE AND BAR ~ 50 Eggs (founded by renowned restaurateur John Kunke) together with Marina Bay Sands has brought U.S. Southern comfort cuisine including their famous 100-year-old recipe - Lewellyn’s Fine Fried Chicken to the shores of Singapore. Wow the recipe is older than many of us! They also have local-inspired dishes like Low Country Laksa. They also have creative and hand-crafted cocktails, including their Blackberry Bourbon Lemonade. So honored that Singapore is actually its FIRST ASIAN venture!